About 2 weeks ago, I started getting the YVM302 error code on my TV, telling me the signal was weak. I followed all the steps in the help menu (incl. retuning), but the message still appears and a lot of freeview channels are now missing (ITV, Channel 4 - basically anything between the numbers 105 and 200). - a retune procedure yielded the same results as before. They concluded that the issue must be with the Youview box itself, and referred me on to the Youview helpline. However, this helpline has closed, with only a recorded message telling me to get in touch with BT TV. I did this, and upon saying I had a freeview issue, was passed back to the exact same person at the Freeview helpline! Since Youview no longer operate a helpline, who can I turn to for help with the actual Youview box? Can anyone here offer any helpful advice? Would you be able to let me know your full postcode (feel free to drop this in a PM)? 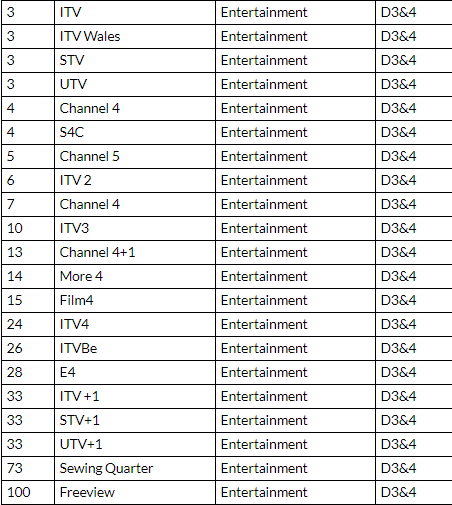 You say ITV and Channel 4 are missing, could you also let me know if you can see any of the following channels? I have exactly the same issue. Please help! A similar poster on the talktalk forum recently, was able to resolve this by taking out the aerial lead and then returning the box so there were no channel's found, and then replacing the lead and again returning. There appears to be a "memory" within the box that can be cleared using this procedure sometimes. It's worth a try. Good luck! Same problem here in Hull with a BT box. Watching 'Yesterday' last night, a message kept coming up, maybe 3 or 4 times, saying the signal was poor. Signal strength was 95% but quality was 0%. Clearly not true. There was no sign of picture or sound break up; the reception was perfect. This morning signal strength is 95% and quality 100%.